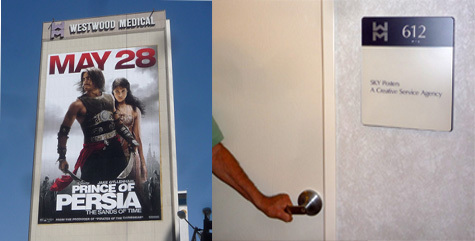 » How Was This Eight-Story Supergraphic Ad For a Movie Permitted as an “On-Site” Sign? How Was This Eight-Story Supergraphic Ad For a Movie Permitted as an “On-Site” Sign? 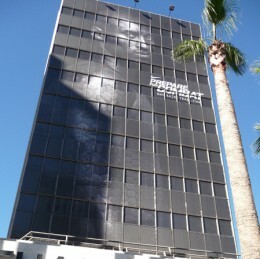 The supergraphic sign above for the movie “Prince of Persia” on a Westwood office building is legally permitted as an on-site sign, which the L.A. sign code defines as a sign directing attention to a product or service generally sold or offered on the premises where the sign is located. There is no movie theater in the Wilshire Blvd. building, or the offices of the movie production company, so how can the sign be considered legally equivalent to the sign on the local hardware store or dry cleaners? For an answer, one most go back more than a decade, when Michael McNeilly (the self-proclaimed artist responsible for the giant statue of liberty images around the city) put one of the “Lady Liberty” images on the side of the building at 10921 Wilshire Blvd. He was charged by the city with putting up the supergraphic without a permit, as well as violating a local zoning prohibition on any such signs in the Wilshire corridor from Beverly Hills to Santa Monica. While that case worked its way through the court, McNeilly changed the sign to one he claimed to be a memorial to the New York firefighters who died on 9/11 in the World Trade Center collapse. Again, he was cited by the city, and this time filed a lawsuit in federal court with the aid of the ACLU, which asserted that McNeilly’s First Amendment right to free speech allowed him to erect the sign without city interference. Two years later, in 2003, then L.A. City Attorney Rocky Delgadillo agreed to a settlement of that lawsuit that allowed McNeilly to keep signs on the 12-story wall of the building, as long as those signs fit the city’s definition of “on-site” signs. According to the settlement, only current tenants of the building with “bona fide office space” conducting “bona fide business” would be allowed to place messages on the signs. Furthermore, those tenants would have to provide proof to the city that they were conducting such a business by having an employee present during normal working hours. Yesterday, we went to the office at mid-afternoon with a local community activist who has tried in the past to convince the city’s building department that the various signs that have been put up on the wall do not comply with those requirements. On the sixth floor, there was an office with the sign, “Sky Posters, a Creative Service Agency” beside the door. (Sky Posters is one of the terms used by McNeilly, who is president of a company called Skytag, Inc.) The door was locked, and knocks went unanswered. We spoke to a woman who was going into the office next door, and she said that in the four years she worked there she had never seen anyone enter or leave the Sky Posters office. As we’ve pointed out in previous posts, McNeilly is a fraud. He claims to be an artist defending freedom of expression when the obvious fact that he is an entrepreneur making millions by putting up supergraphic signs wherever he can find willing property owners and then suing to block enforcement of the city’s ban on such signs. He has used one of the country’s most revered images—the statue of liberty—as a placeholder for signs hawking movies, TV shows, and other corporate products. In 2008, he put up a huge “Lady Liberty” image on the opposite end of the Wilshire Blvd. building, and then sued the city in federal court and succeeded in getting a judge to order a preliminary injunction protecting it from city enforcement. Lady Liberty is long gone, of course, and now a Nike Ad featuring a 10-story image of Kobe Bryant greets pedestrians and motorists navigating the single most heavily-trafficked intersection in the entire city of L.A.
Based on statements by media buyers and ad agency professionals, advertisers pay upwards of $100,000 a month for supergraphics like that in those kind of locations. The “Prince of Persia” supergraphic on the west end of the building, visible from the 405 freeway almost half a mile away, made news two days ago when Curbed LA reported that the building owner was speaking out against a proposed development across the street that would block some views of the sign, including the one from the freeway. A statement, perhaps, on how valuable those views are for a sign that is “on-site” in name only. The current City Attorney, Carmen Trutanich, who last month filed a huge lawsuit against another supergraphic company and a number of property owners, has not endorsed any view that the McNeilly supergraphic is a legal, off-site sign.